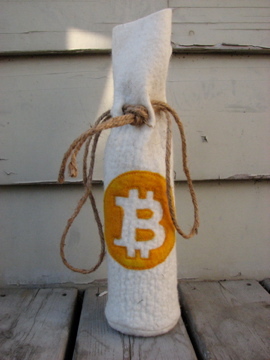 Last week I started accepting Bitcoins at my online shop as well as on Etsy. For those of you who haven't heard, Bitcoin is an online currency that was created by a programmer named Satoshi Nakamoto. It has been gaining a lot of popularity both with users and in the media. The simple way to understand Bitcoin is to think of it as digital cash, instead of a bank holding your money and sending it at your request to Amazon or Ebay, you hold money in a digital wallet and send it directly to whoever you want to buy from. This is called a peer to peer currency exchange that has no middle man (and no service fees!). A lot of people see a lot of different things in the rise of Bitcoin, some see it as a way to buck the current monetary system. The main differences between the two are, Bitcoin isn't based on debt i.e. if you don't have any, you can't spend any. And new Bitcoins are added to the market at a fixed predictable rate, rather than at the discretion of the Government. Others see it as a way to hide online transaction therefore avoiding taxes (tracking bitcoin transaction is quite difficult so I'm told), and still more see it as an investment opportunity. Although quite young, fortunes have already been made and lost speculating on Bitcoin. So, why am I joining in? Well, the best answer is, for FUN! Why not? Its already been a great experience, I haven't made any sales yet but I have increased the traffic on my website and my Etsy shop and I've had a lot of interesting discussions with the Bitcoin community. I'm also being interviewed for a feature article on one of the Bitcoin Business directories! So if thats not a good reason I don't know what is. Alright, thats it for now, check back in a few days for my article on new line of Aprons!